Looking for the perfect couples retreat? Or perhaps a getaway with your In-laws or parents? Our featured cabin of the month is designed for total comfort and relaxation. Luxury is defined by the amount of comfort you experience during your stay. All we can say is, this Gatlinburg cabin is luxurious, private and wonderful for any occasion. With two large bedrooms with king size beds, three bathrooms, total privacy, natural light throughout and prime location there is no wonder why this Gatlinburg cabin rental is so special. Tucked away in the trees, you will find our Gatlinburg cabin, Splendor Pines. An authentic log cabin from the outside appearance to the interior decor, there is nowhere quite like this Gatlinburg cabin rental. From the moment you arrive, you will feel relaxed and secluded in the best mountains in the country! The Great Smoky Mountains are waiting anxiously for your arrival! Set your bags down in your room and meet back in the living room for some much needed rest. Take a load off in the comfortable couches and enjoy the views from the natural light pouring in! If it gets a little chilly, make a small fire, you’ll warm yourself up in no time! It’s time to enjoy the next few days you have in this beautiful Gatlinburg cabin! 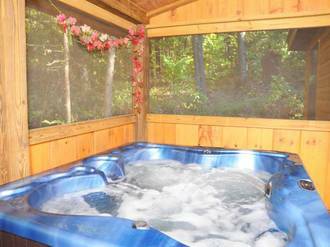 After a long night of catching up and storytelling, the hot tub will be calling your name! If you don’t own a hot tub at home, what a pleasant treat for your much needed vacation! As night falls, grab your suit and take a dip in the hot tub. You can hear the mountain sounds at night when everything is calm. Soak it all in! 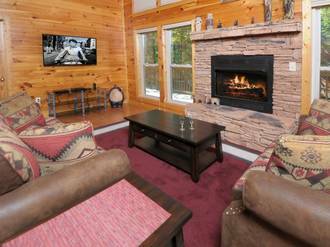 Book your stay at this luxurious 1,550 square foot Gatlinburg cabin rental! No matter the occasion, Splendor Pines welcomes you with open arms! Find out more about this cabin here!